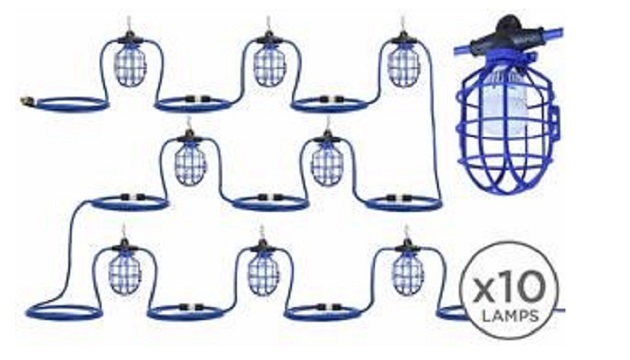 Industrial lighting leader, Larson Electronics LLC, has just released a new LED string light system for temporary lighting that can be daisy chained for flexible illumination options, and features 10 high output LED lamps producing a total of 10,500 lumens. This 106-foot LED string light system is an efficient and reliable temporary work light solution for tunnels and underpasses. 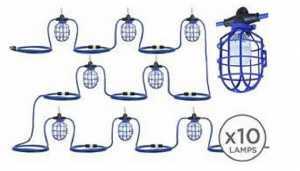 The Larson Electronics WAL-SL-10-LED-12.3-QDC-TLP string light system consists of 10, 10-watt LED globe style lamps, each globe light delivering more light output than a 100-watt incandescent. 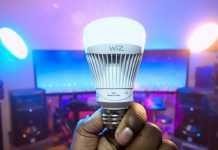 The 10-watt LED bulbs draws 10% the electrical power of a standard 100-watt bulb, making them suitable for standard voltage and low voltage applications. Each LED light screws into a molded E26 lamp socket and the bulb is enclosed in a bird cage style plastic guard for protection. A hook eyelet that allows operators to hang these tasks lights overhead. This 100-watt assembly operates on 120-277V AC and multiple stringer sections can be daisy chained together via 3′ whips terminated with a NEMA L5-15 or L6-15 configuration twist lock plug and outlet. This temporary string lighting system is constructed of 12/3 STJW cord that is fitted with an industrial grade cord cap for easy connection to common wall outlets. “This stringer light system is perfect for temporary work lighting and is extremely versatile due to daisy-chaining capabilities,” said Rob Bresnahan, CEO of Larson Electronics LLC. 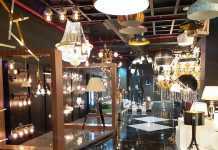 “Lamps can be removed from the system, or additional lamps can be added for applications that need longer lighting solutions,” he added.